Circulation: This is where the public can apply for and receive a Herrick Memorial Library card, check out & renew items and return borrowed items. This department also provides voter registration forms, golden buckeye forms, and copier/FAX services for a fee. Adult/Reference: This is where the public can receive “Reader’s Advisory” services to assist in finding materials in your area of interest, reference and research assistance for information needs and genealogy searches, computer assistance and training in the library. This department also provides programming for adults, ages 18+. Youth Services: This department provides services to children and young adults (teens). The Children’s staff provides programming to children, ages 6-months to 11-years and the Young Adult staff provides programming for children, ages 12-17-years. Lap Sit: for infants, ages birth- 24-months, and their parent(s)/caregivers. This level is a great way for adults to begin a daily ritual of learning rhymes, finger-plays, songs and games that can be shared with their young children. Toddler Time: for young children, ages 10-months to 3-years, and their parent(s)/caregivers. These programs are a more advanced story time where the young children learn to interact with other children of their age. They are an active one-on-one lap sit program that incorporates reading, singing, rhymes, finger plays, dancing and simple crafts. With your help, we can develop and nurture your toddler’s love of books and the library. Growing Readers: for children, ages 3-5-years. These programs are a time for children to listen to stories centered on a different theme each week, along with crafts and early literacy activities to help develop the child’s readiness skills for school. After School and Weekend Programs: these once-a-month programs for school age children are designed to keep the children reading. Each unique program will be scaled to the children’s interest level and will introduce them to a wide variety of books, topics, and crafts. 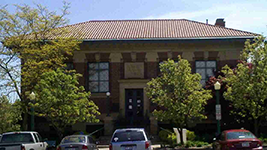 Summer Reading Programs: the Library Staff provide summer reading programs for all age levels, birth – 99 years, for eight weeks in June and July. These programs are designed to prevent the loss of reading skills through the summer months. Teacher Services: the library provides a special teacher card that allows teachers to check out Classroom collections, a large variety and quantity of books to use in their classrooms tailored to their curriculum. The teacher’s card is fine exempt and items are checked out for six (6) weeks. Teacher C.O.R.E. (Classroom Opportunities for Reading Enrichment) Collections: these collections provide multiple copies of paperback titles and teacher guide for educators, librarians, and others interested in sharing literature with young people. Classroom sets for children, grades 3-12, are available to check out on a teacher’s card. Sets check out by advance reservation for nine (9) weeks at a time. Click CORE to see the “teacher selected” titles to choose from for your classroom needs. These collections were generously funded by a grant from the Community Foundation of Lorain County. Teacher Activity Collections: these collections provide multiple copies of paperback books and a teacher guide for elementary school educators, librarians, and others interested in sharing and developing reading skills to young children. Classroom sets for grades 1-4, are available to check out on a teacher’s card. Sets check out by advance reservation for nine (9) weeks at a time. Click TAC to see the “teacher selected” titles to choose from for your classroom needs. Young Adult Programming: The library staff provides a once-a-month program for young adults, ages 12-17, to expand their interest in reading and life-long learning. Check the library’s calendar for program offerings each month. Adult Programming: The library staff provides a variety of programs to enrich the lives of adults. Check the library’s calendar for program offerings each month. Homebound Delivery: this service is available to local nursing homes and homebound residents. These patrons must be 65-years of age or have a temporary or permanent disability which prevents them from physically visiting the library. Call 647-2120 for more information. Tours and Programs: Book talks, historical presentations, library tours, and other programs for all ages are available on request, subject to staff availability. Let us know what you have in mind and we will try to accommodate your request.